The harder the steel, the softer the (grinding) stone should be. Soft stones disintegrate slowly and deliver more new abrasive particles. 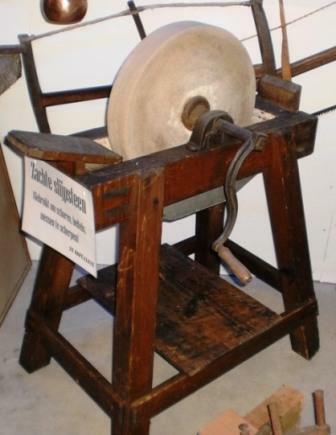 (A knife) grinding is done by moving the blade back and forth on a (wet) grindstone. Use a coarse to grind rough material (e.g. with broken pieces), a moderate to get the cut at the correct angle (an acute angle of 10 degrees) and a fine to get the edge sharp. At the first you practice a lot of pressure, on the last just a little. The remaining burr (curling sliver of metal, rolled edge) can be wiped and straightened by steeling. A steel (honing steel, bar) is used to straighten the microscopically thin cut which deforms. You use it by gliding the knife over the whole blade length with uniform pressure at the same angle on the steel like if you want to peel off thin strips. A knife with a unilateral cut you grind only on one side, but at a sharper angle. Avoid using rapidly rotating stones, because with the produced heat the hardness disappears. So rather handiwork. 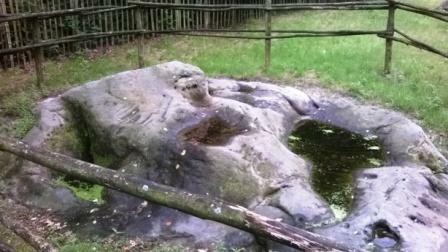 In Zonhoven (be) are 7 large blocks of hardened sandstone for centuries. Around 8 to 6000 BC there was a settlement of prehistoric hunters. Between 4,300 and 700 BC is one of these stones used as polishing stone. It wear spurs and grooves that show where users drag and grinded their knives and axes.